Sorry I totally disagree with the high ratings other people have given about this restuarant! I ate there for dinner for first time yesterday with my family and we were all shocked at the standard of the food! The food was really bland especially the meat and the chicken looked rare still... Also all meat and chicken didnt taste fresh wonder how old they are... Only thing that was nice about the food was there bread which we filled our self up on coz we were hungry! Unless they improve there food quality I won't be going there again! Service was good and staff friendly though.. The food at Sarchnar is to die for, absolutely delicious the prices are excellent and the service is top notch. Highly recommended. me and my husband had dinner there for the first time. The food is well prepared and absolutely delicious. The Quality of the food is very good and it tastes exactly same as the restaurants back home (Kurdistan).We were trying many diffrent kurdish restaurants but this is one of the best in europe. 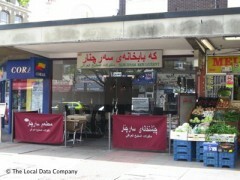 This Kurdish restaurant has a variety of Kurdistani and Middle Eastern Dishes available.